Colorful, vivid and detailed world map, circa 1700 published in Amsterdam by Gerard and Leonard Valk during the Golden Age of Dutch Cartography. 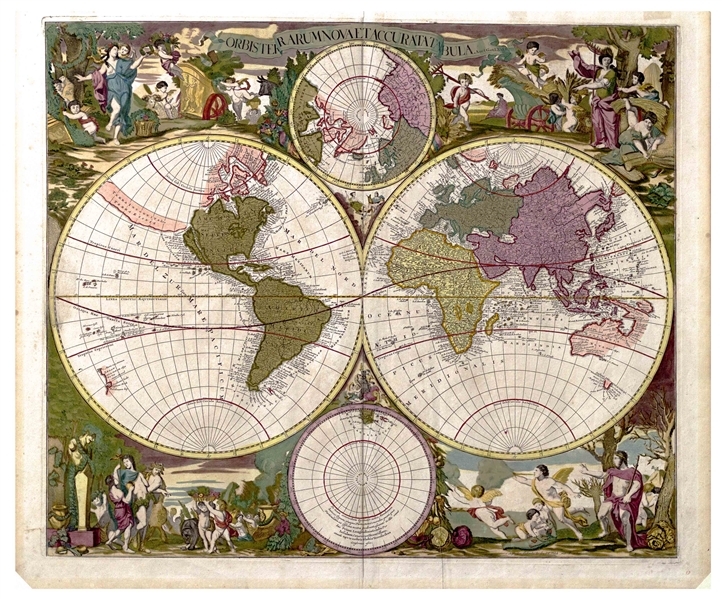 Hand-colored engraved map presents both the northern and southern hemispheres and both the Arctic and Antarctic polar projections, along with allegories at each corner representing the four seasons. Titled in Latin at top ''Obis Terrarum Nova et Accurata Tabula''. At the time, in the late 17th century, Amsterdam was the leading authority on map making, with Gerald Valk a leader within the field. This map was therefore extremely accurate for its time, incorporating the latest cartographic knowledge including new surveys of California, Florida and the Mississippi river. Large maps such as this one were created for aristocratic homes throughout Europe, with this copy astonishingly well-preserved and bright. Map measures 25'' x 21.5''. Flattened vertical fold and minute toning at edges, overall in near fine condition.